Do you like doing things in large groups that appear to be totally silent? If so, then Sound Off Yoga might be just the thing for you! The new yoga classes combine silence and music for a silent yoga class that isn’t actually all that silent. Participants are given wireless headphones and everyone is fed the same music, which is curated by Sound Off DJs, according to YogaDork. The classes feature Vinyasa Flow yoga and will offer the unusual spectacle of yoga classes taking place in complete silence—or so it would seem to the casual observer. 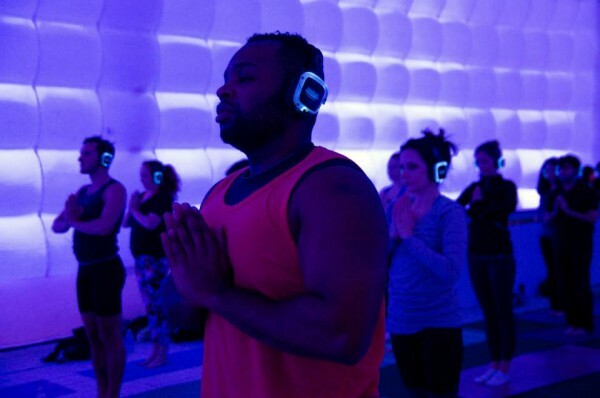 Participants will be able to listen to instructors through their headphones, according to Sound Off, so if you find yourself easily distracted, this may be the perfect opportunity for you to do yoga without any outside noises or interruptions. If this sounds like a silent disco, that’s because Sound Off’s specialty is silent discos and other silent events. Its Facebook page claims that the company can integrate a Sound Off “into any kind of event or venue,” touting its past successes at silent rooftop discos, silent concerts in the woods, and a silent Thanksgiving dinner complete with headphones. “With a range of up to 500 yards, silent discos offer the opportunity to create dynamic and out of the box events only limited by where your imagination can take them!” says Sound Off on its Facebook page. The kick-off to the Sound Off Yoga series was held on February 7th at the Cube at South Street Seaport in New York and Mission Dolores Park in San Francisco; upcoming events will be held on February 21st, February 28th, and March 3rd in New York, and on February 21st in San Francisco. You can sign up for each hour-long, $20 class by reserving a spot in advance at Sound Off Experience. Attendees are asked to bring their own mats. 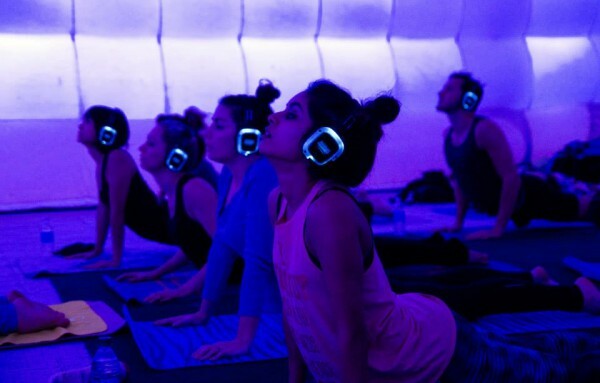 Would you feel less distracted doing yoga with headphones on? If so, would you rather choose your own music, or does the communal aspect of Sound Off appeal to you?